After days of raining, we had a sunny day today on Christmas. 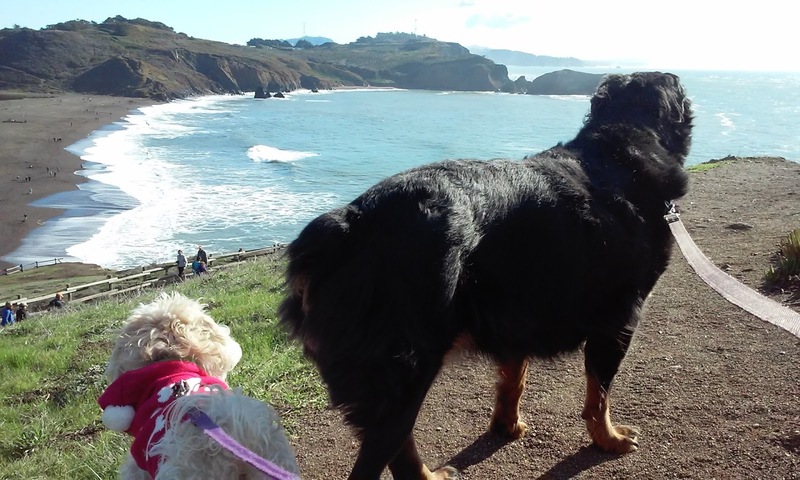 I took advantage of the nice weather and drove to Marin Headlands in Sausalito with the pooches. 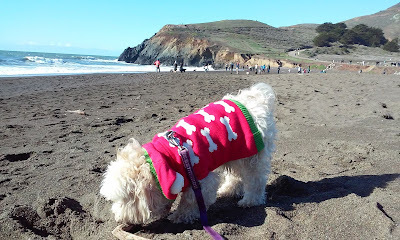 I ended up at Rodeo Beach. It was beautiful out there. I don't think I had ever been out there before. It was also Cracus' first day trip. He was so excited and couldn't stop pulling and sniffing everything. There were many dogs around. Some had leashes on and some were leash free. Since it was Cracus first time there, I kept both of them on the leash. It had been a while since I took Kelsey on a day trip, too. She was very excited as soon as we got off the freeway. She got up in backseat and started barking at the bicyclists passing by the car. Kelsey is probably about twelve years old now, which is quite old for a dog her size. She has been getting slower and slower. However, she always wants to come along. I was worried she would not be able to make it up the hill. As soon as we got to the top, she laid down and took a break to enjoy the view. Both Cracus and Kelsey seemed to really enjoyed the hike along the coast. I had a good workout as well. Both dogs were so tired after they got home. They went to sleep early tonight. Last week one of my new colleagues gave me a set of Lékué egg cookers as a holiday gift. They are just the cutest things. If you have been following my blog, you know that I love mushrooms and anything mushroom shaped. I have only been at my new job since end of August this year, so I was just amazed how she picked this gift for me. Today I finally got the time to try it out. I brushed inside of the cooker with olive oil and lined it with some baby spinach. I put a couple grilled shishito peppers in there just because I grilled a bunch last night. Now about these shishito peppers, according to Wikipedia, about one of ten peppers is spicy. Last night I had them for the first time, and the first one I ate set my face on fire. I was very surprised and wasn't sure if I could eat another one. Fortunately, the next 2 peppers weren't as spicy, but I would say one out of five is spicy for the batch of peppers I got. 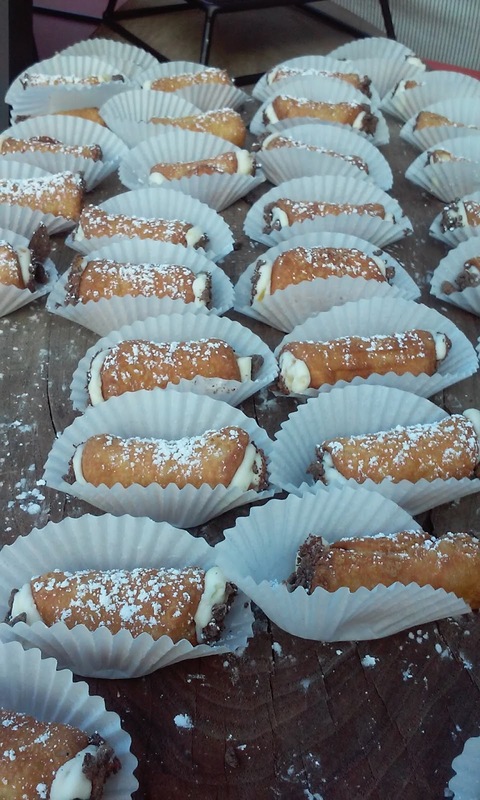 They are very good though, so I couldn't stop eating them. I think my tolerance for hot peppers just went up a notch last night. I sprinkled a little salt and pepper and put the lid back on. It was cooked in microwave for about 50 seconds, then I heard it popped. I guess the egg popped. Luckily it didn't make an explosive mess in there because it had a lid. The egg was fully cooked after 50 seconds. Next time I will try 40 seconds for a softer egg. This is a great way to cook an egg with other vegetables or meats. I am going to pick up some gorgonzola cheese and mushrooms later for more experiments. Shortly after we moved to our new location, I found out that my next door neighbor is a basket artist. I was very intrigued by it. 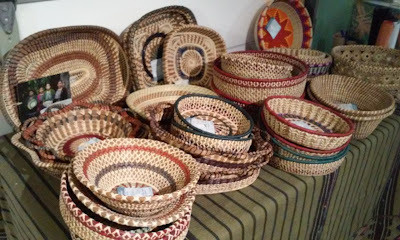 When I hear basket making, I tend to think of South American or Southeast Asian women in small villages making baskets by hand for generations to make money as a living. I know my next door neighbor doesn't just make baskets to pay her bills. This is one of the most expensive places to live in the world! A few nights ago, as we were taking out our garbage, Michelle, my next door neighbor invited me to her pottery and basket party on Sunday. Finally! I would have a chance to check out her baskets! I was very much looking forward to it. 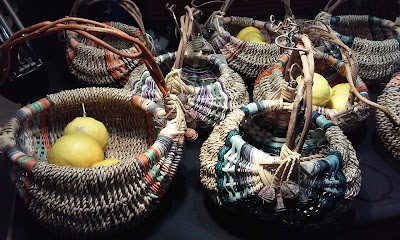 Today I went over to my neighbor's house in the afternoon, and I was amazed by all the beautiful baskets. Some of them were made by her, and some of them were made by village women in Guatemala. 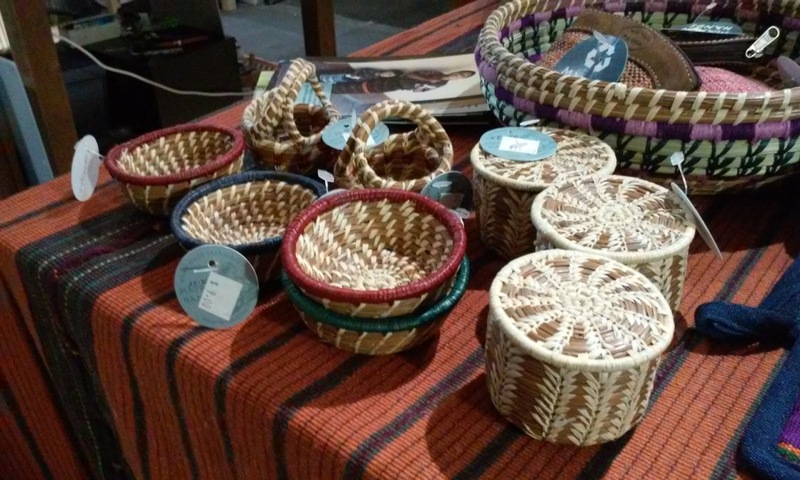 Michelle works with Mayan Hands, a fair trade organization, to help Mayan women support themselves by selling baskets and other handmade items directly to the consumers. Michelle, being a master basket weaver, actually has traveled to Guatemala to teach the women basket weaving techniques. Wow! I guess someone has to teach Maya women how to make baskets. Nobody is born with that knowledge. 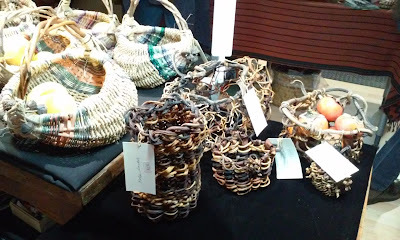 I got Michelle's permission to take photographs so that I can show them to others who love handmade baskets. I want to help Mayan women, too! Almost a year ago, one of the children in school handed me a little plant as he came to school in the morning. I thought it was cute and put it in a little cup of water thinking that it would grow some roots. 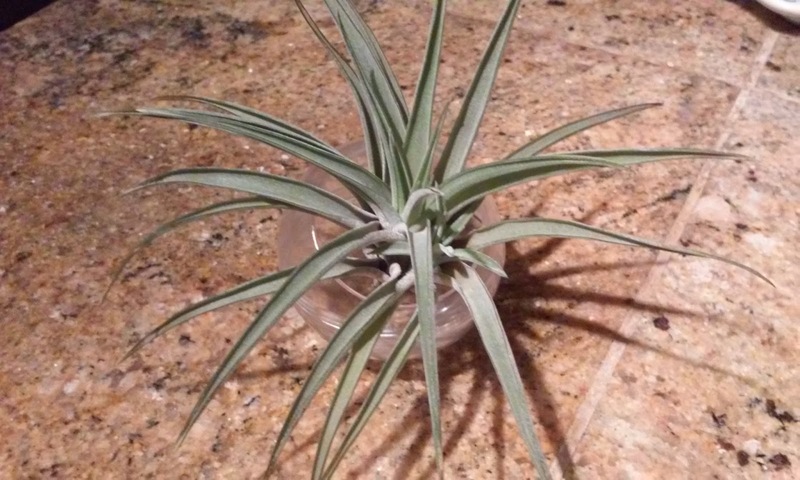 Someone in the office told me it was an air plant that simply grows in air. What? I immediately started Googling it. I became fascinated by it. It was growing a little baby plant within the plant. I eventually broke it apart when it got bigger so I could give it to someone else. Unfortunately I was told the baby air plant didn't survive. It is now growing another baby plant as you can see a little bit in the photo below. I can't wait for it to get bigger. I would like to have multiple clusters of them. I would like to create some terrarium gardens and hang a few around the house. 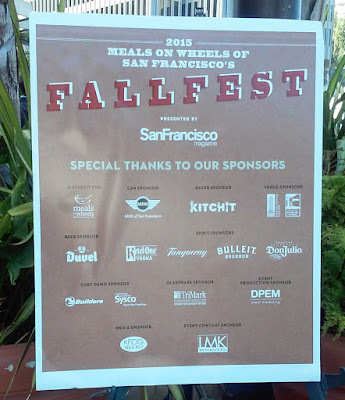 Volunteering for Fallfest has to be one of the best secrets of San Francisco. 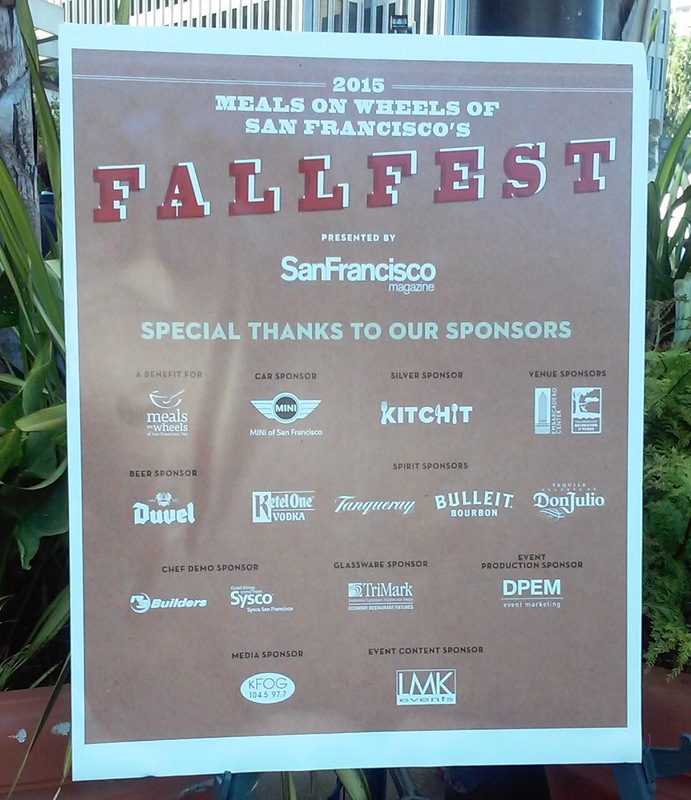 Where else can you volunteer a few hours for a great cause and get to sample some of the best appetizers from some of the Bay Area's top restaurants? For wine drinkers, you also get to sample wine. I just drink coffee and eat gelato. Gelateria Naia was there entire day passing out different flavors of gelato. Look at all the mini cannoli! In addition to food and drinks, there were cooking demos, live bands, silent auction, BBQ contest by different fire departments, Blue Angels flying by, and people watching. You know who go there to show off their dresses or their bodies. It's always fun to see some outrageous outfits. 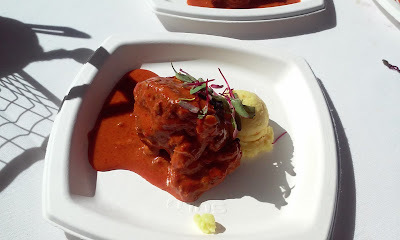 Of all the small plates I sampled, I loved the roasted pork in a spicy middle eastern flavored sauce with potato salad the best (see photo above). It was a very generous portion, too. Most of restaurants gave less than half of this serving. It was so good that I had to go back for a second sample. 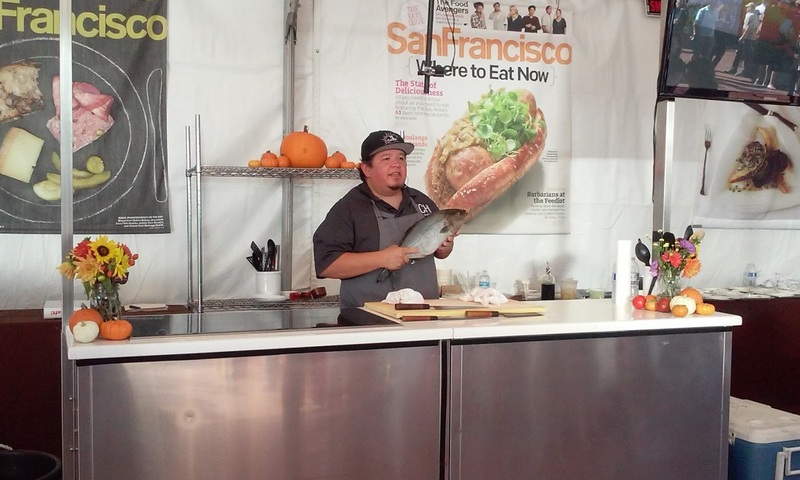 I also got to see Chef Tim Archuleta from Ichi Sushi doing a sashimi cutting demo. He made it look easy. It was another perfect day volunteering and eating in San Francisco. I just loved it! 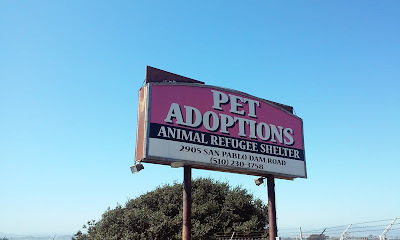 I came across Animal Refugee Shelter website on November 1, 2014, when I was looking for a dog to adopt around my area. I had already stopped by Berkeley Animal Services and didn't find a dog that was a good fit. 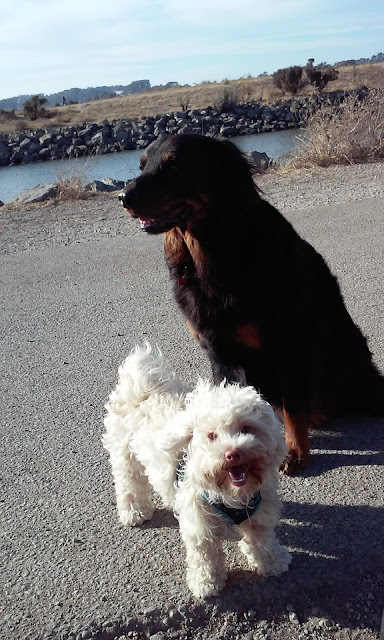 I found a very cute and playful large labradoodle, who I adored, but I knew that I wasn't going to have enough time to devote to another large dog. I found a few possible dogs on Animal Refugee Shelter and The Milo Foundation websites. I stopped by Animal Refugee Shelter first, and there I found Cracus. It's been almost a year since I adopted Cracus. I found out that his shelter was having a community BBQ today and wanted to bring Cracus for a quick visit. Cracus appeared to be a little nervous when we got there. Perhaps it was from all the dogs' barking. 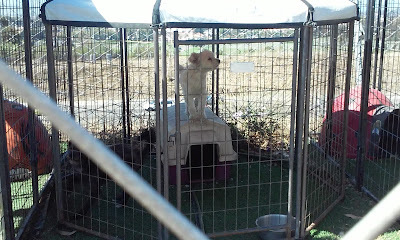 Cracus barked a lot when I saw him behind bars on November 1st, 2014. 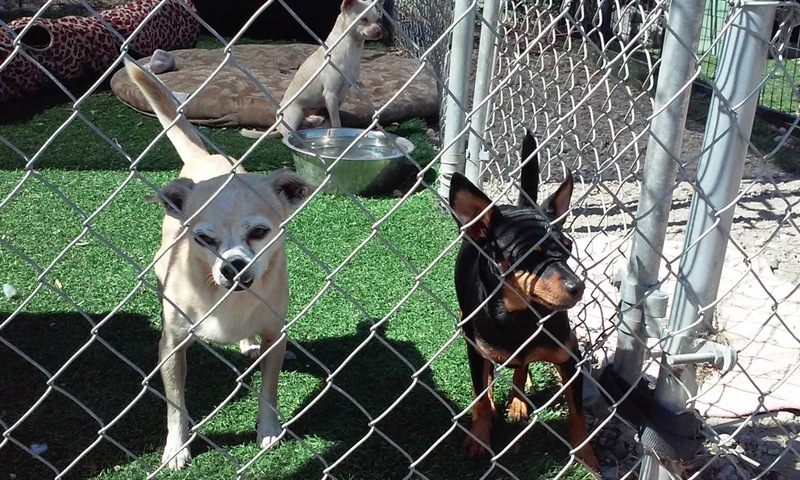 He was happy to see Blythe, who runs the shelter. He put his head on her lap. I wish I had taken a few pictures. I recently had a conversation with a woman in her 20's. She bought a male Akita/husky from a breeder a few years ago and has not get the dog neutered. She told me that she isn't able to board her dog at any dog boarding facility because he's not fixed. I asked her whether she's planning on breeding her dog. She said no. I asked why not get the dog fixed? She said that is cruel, and she will not abuse her dog. That was an interesting point of view because I feel it's a much bigger abuse when unwanted pets are euthanized. I asked her what if he gets out and get a female dog pregnant? She said he is not going to get out. She also insists her dog is very gentle and has no aggression. I couldn't say anything else to make her see that getting our pets fixed is the responsible thing to do. Just look at all these dogs waiting for homes. Another year has gone by and now the entire arbor is almost covered by passion fruit vines. Some of them have extended to the top. This was what I had hoped for. 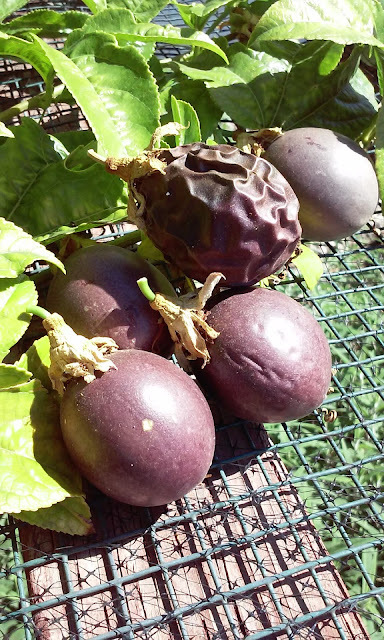 Even though I have moved to a smaller location, the original Sand Village Farm is now occupied by my parents, so I still get to go pick all the passion fruit I can ever eat. I thought of propagating some to my little backyard, but there is no reason to grow the same fruit. My kiwi vines will need a few more years to reach maturity to produce fruit. In the meantime, I am thinking of growing a couple dwarf fruit trees. Perhaps a mullberry tree and some gooseberries. I will be working on my little backyard garden in the upcoming months. The wrinkled ones are the sweetest! It has been almost a year since we moved to our new house. A couple days ago I stopped by The Home Depot to make a copy of a key for work. While I was waiting, I saw all the custom keys they have for sale. One particular key got my attention - the dog with a bone key. I got it for my house key. 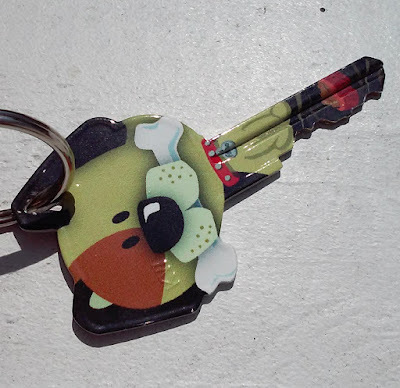 It is the only appropriate key since there are more dogs living in this house than human. My dog sitting business through Rover.com is doing quite well. There are more demands than I can take on. Today I have the most number of dogs on one day - 5 including my own 2 dogs. Two of them will be picked up this evening. I have several repeat customers now and many requests for day care, which unfortunately, I am not yet able to provide with my day job. On weekends, I love sitting in my little backyard with my morning coffee watching the dogs play. 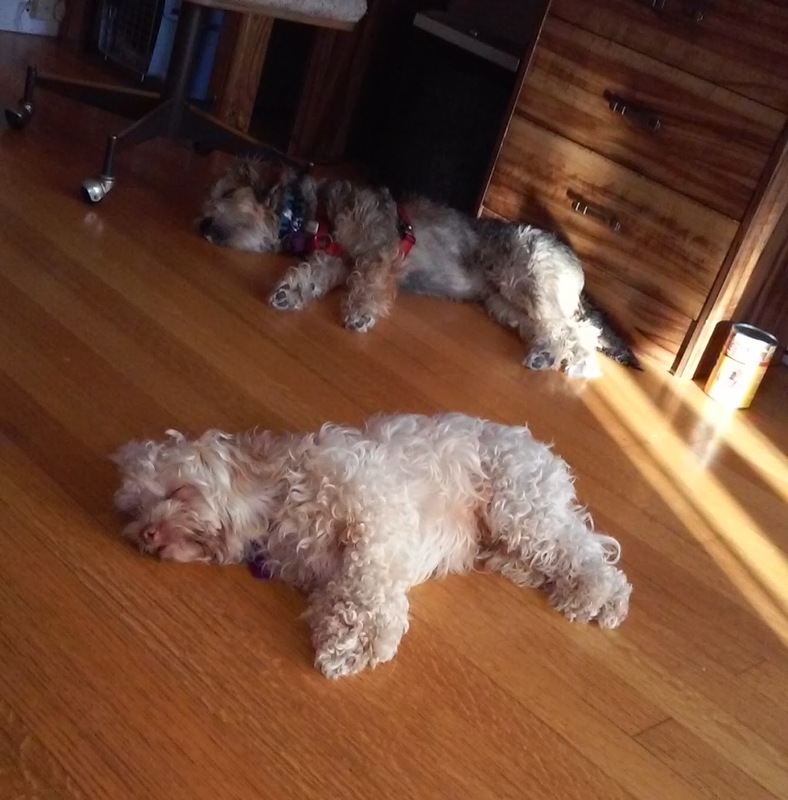 They can run through the dog run on the side of the house, jump through the dog door in the garage, then run through the house and come out from the backdoor into the yard again and repeat. It's fun watching them run in a pack and loop around the house. 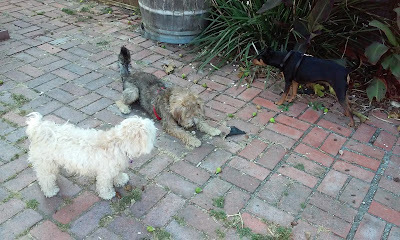 I have learned how to feed 4 dogs at the same time without them fighting each other. I have also walked 4 dogs at the same time although it wasn't as graceful as it should. It's all been a very fun and interesting experience. I have originally intended to spend a couple nights near Milford Sound; however, the accommodations for Milford Sound are rather limited. After doing further research around Fiordland, I decided to visit Te Anau and take a cruise through Doubtful Sound instead. 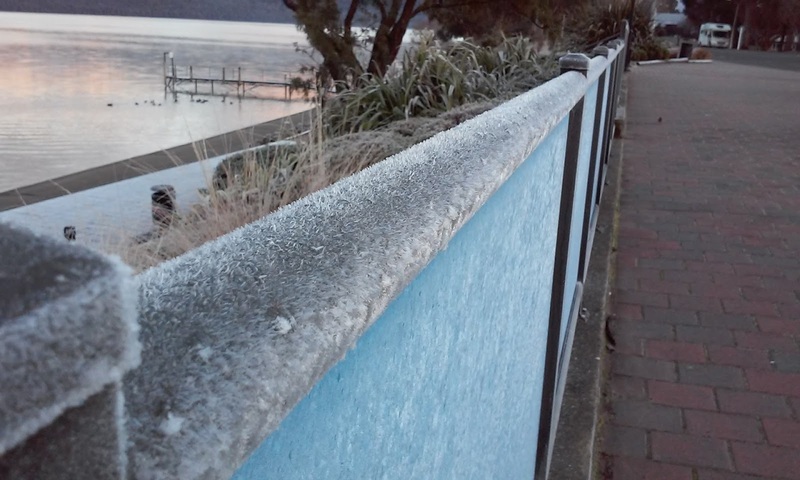 There are many choices for accommodation in Te Anau. 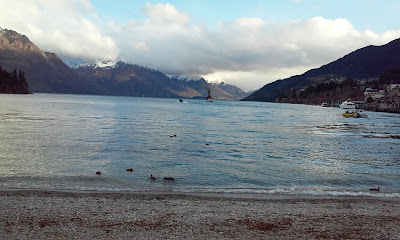 I was able to get a single room at YHA Te Anau for a very good price. While I could share a room with others to save even more money, my dormitory days were long ago. I much prefer to get my own room unless I am only transiting. Te Anau is very small. There is one street called "Town Center," and that IS the town center. Many stores and restaurants are closed for winter. There are 2 major grocery stores, Four Square and Fresh Choice, Both stores are just a few blocks away from YHA. It was nice to be able to prepare my meals in the spacious YHA kitchen and save money for bigger cities that I will be visiting. I booked an 8-hour Wilderness Cruise with Real Journeys. It involved getting on a bus, getting on a small ferry, getting on a bigger bus, and then getting on a bigger cruise. On the way back, we got back on the bus again. It was a long journey, so people started to connect with each other to exchange travel stories. The views were incredible, and it was a plus to have good companies. The weather was nice once we sailed out in the open. We were told that it had been 30 days since the sun was out and the sky was blue. We all felt really lucky! 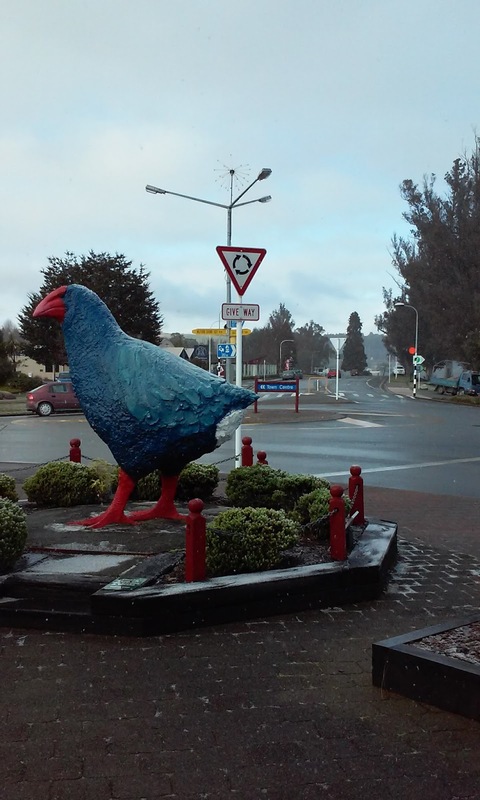 We departed for the cruise at 8:45 a.m. By the time we return back to Te Anau, it was about 6 pm and completely dark. I went sleep early. 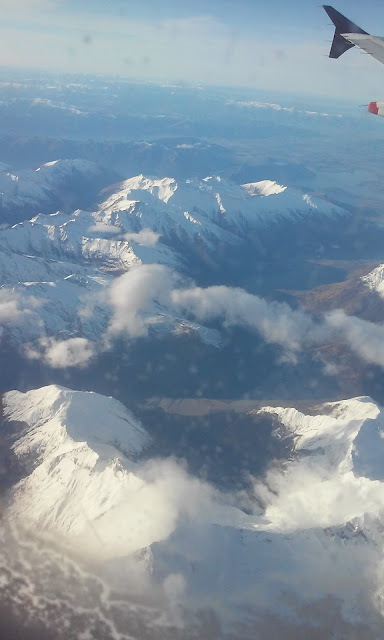 After more than 20 hours of traveling - from BART to SFO to Auckland and finally Queenstown, I have finally begun my second journey to Middle Earth on July 4th, 2015. I have not stopped thinking about coming back here ever since my last visit in July 2014. I wanted to visit more of The Lord of the Rings locations and just to see more of this beautiful green country. It was however difficult for me to leave Kelsey and Cracus for more than two week especially since this would be the first time I am away from Cracus since he was adopted on November 1st, 2014. I stayed at YHA Queenstown Lakefront for my first stop. My home for the first two nights faces beautiful Lake Wakatipu. It involves a 10-minute walk into town, but it's a good way to start the day. This is where people come to ski, snowboard, and do bungy jump. I don't do any of those. 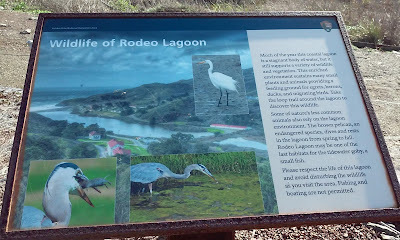 I am here to see the beautiful scenery and to unwind from the hectic life of an elementary school administrator. The air is cold there, but I rarely feel cold when I am traveling. I am on foot for most of my journey, and it keeps my blood pumping. 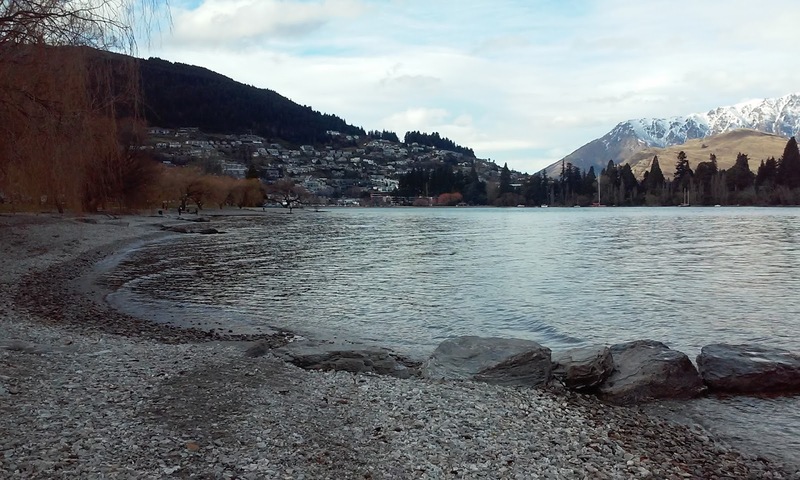 There are many shops in the small area of Queenstown city center. As soon as I got off the bus, the display in the store window caught my attention. 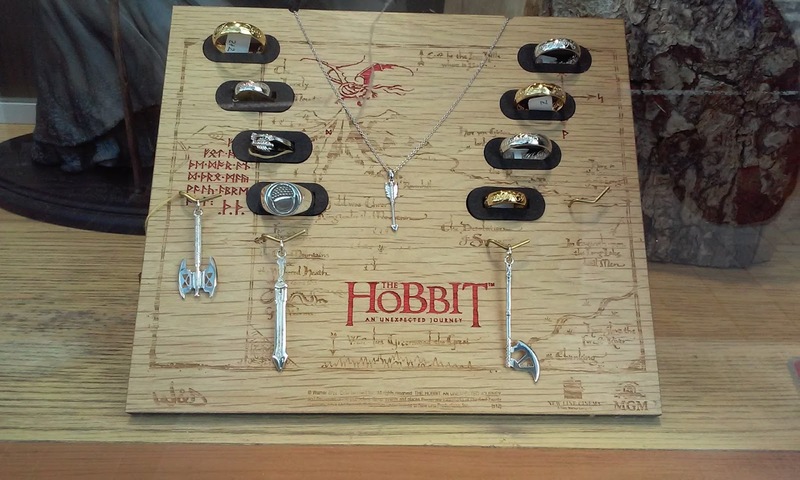 It's a set of The Hobbit rings and necklaces. This is definitely Middle Earth. Tomorrow I will join a Safari of the Rings tour. It's been a month since Dusty passed away. He's been buried next to the kiwi vines. I have hosed the cage with water to make it as clean as possible. I wasn't sure what to do with it. It's a well built cage, so I certainly didn't want it to go to the landfill. I finally decided to post it on Craigslist's free section today. 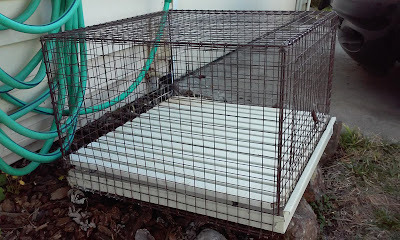 I got the cage from Craigslist nine years ago but paid a small amount of money for it. I was surprised to see this cage is made in Italy! I don't know exactly how old this cage is, but as we know, almost everything is made in China these days. It's a very well made cage with two openings, one in the front and one on the side. The bottom panel isn't made of wire, so it's better for the pet's paws or feet. I posted it as "first come, first serve" but someone emailed me a number and requested for a call back. 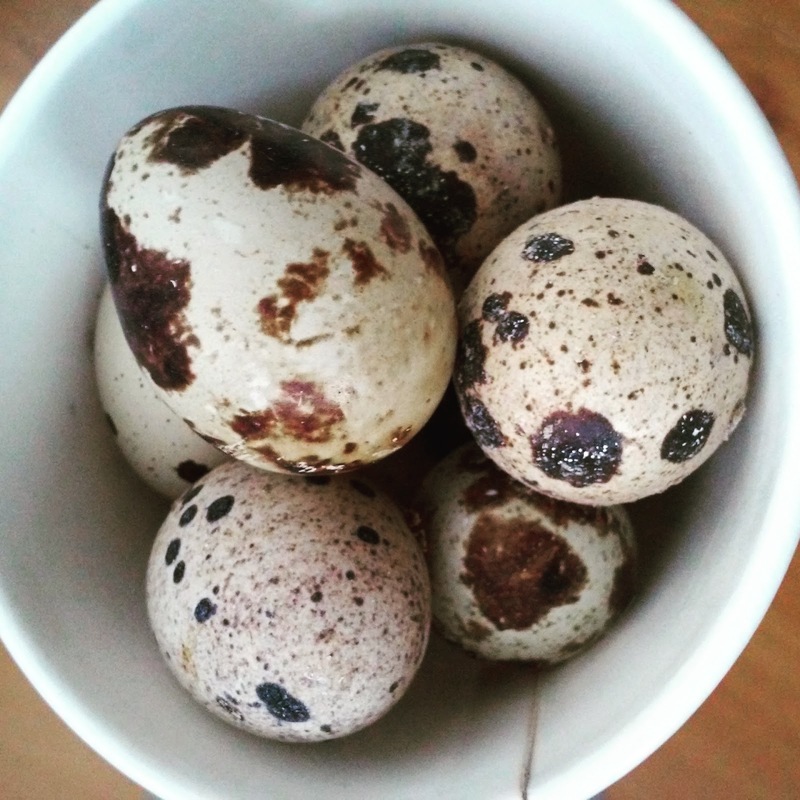 He wanted the cage for his quails and would bring me some fresh quail eggs. That's more than what I expected. It was smart of him to make sure that I still had the cage before driving all the way over from San Pablo. 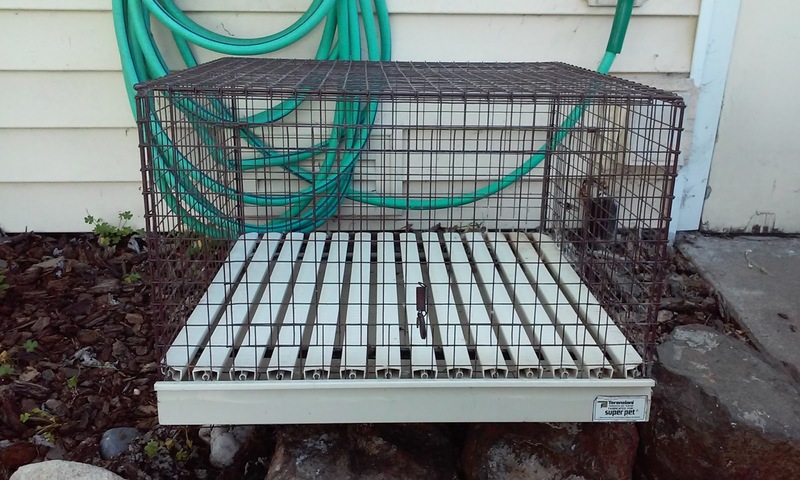 I was happy that someone wanted it for other animals instead of taking it for scrap metal. I brought the cage back into the driveway and waited for the quail guy to come. I am happy that the cage will be put into good use for many more years to come. 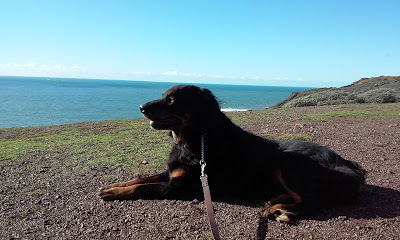 I adopted Dusty on May 13, 2006 from a family in San Rafael. 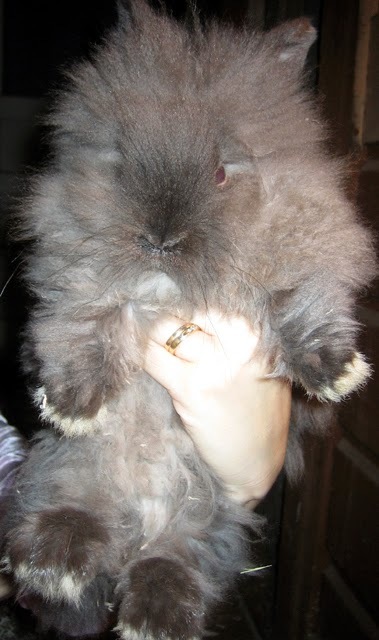 He was just a few months old at the time. The photo above was the first picture I saw of him. It was love at first sight for me. At the time I lived in Mountain View. I have since moved twice more, and Dusty had been with me all this time. It had been almost nine years. I knew Dusty was getting old and slow. A few days ago he had stopped eating and drinking. I knew the time was getting close. In the last two days, he was not able to sit up anymore. I came home from work today, and he was still alive. A couple hours later he had taken his last breath. I will miss him and all the years we spent together. 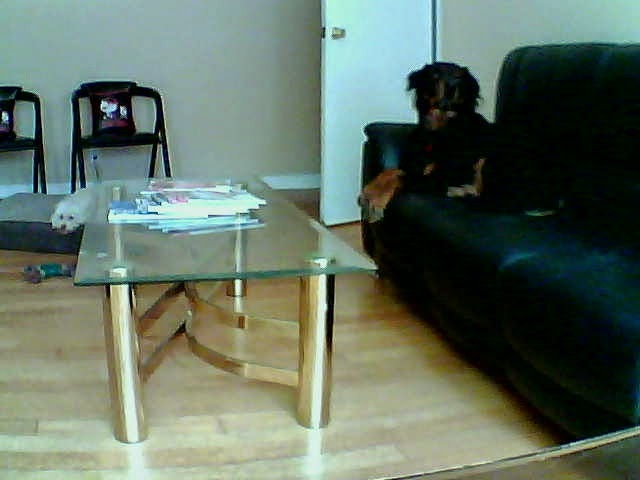 A few weeks ago one of my co-workers showed me how she could watch her puppy through the WiFi camera on her iPhone. I was so intrigued. It appeared to be much easier to set up than I thought. I asked her a lot of questions. I figured if her father was able to set it up, I should be able to do it as well. She has Motorola WiFi HD Home Monitor Cameras. They were just over $100 for 2. She showed me that they were available at Costco and Walmart. When I finally got around to make the purchase, they were no longer available. I started doing product research and found Foscam WiFi Cameras. They come in many different models. After much comparison, I settled on NVision FI8910W. I got 2 pack for $106 from Amazon. I had a $10 gift certificate. These cameras are not in HD so they are a little cheaper than the HD model. However, they can be remotely pan and tilt, which the Motorola cameras can't do. I also didn't need to pay for any third party software. After all, I think these are a better deal than the Motorola cameras. As I was setting up the cameras, I ran into a complication. I was able to get everything working properly at home on the first night. I found a very helpful Youtube tutorial from Awkward Hamster at https://youtu.be/2xKu4uZtt3M. I watched it carefully several times. Everything worked until I got to work. I was not able to access my camera login page. Okay, so perhaps I missed something. On the second day I set up IP forwarding. Everything looked great. 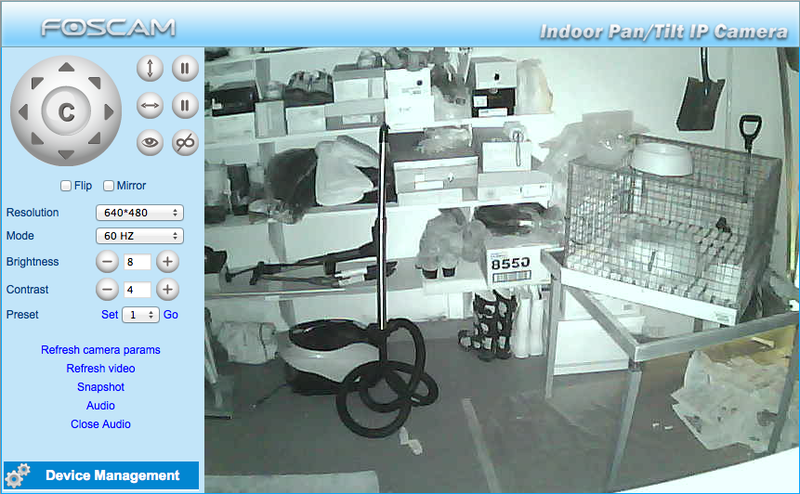 The IP address pulled up my cameras at home. I got to work, and it was still unable to connect. I ended up emailing Awkward Hamster for advise. He was stumped as well. Third night I got home, I started digging for information on my router. It was obvious to me the problem was that my ports were not open and couldn't be viewed outside of my network. I have a Motorola SURFboard SBG6580. I found the answer I was searching for at http://forums.comcast.com/t5/Home-Networking-Router-WiFi/Port-Forwarding-for-an-IP-Camera/td-p/1529477. It turned out that I had to enter 0.0.0.0 for the field that asks for external IP. How would anybody know this? I filled in my external IP of course, and it just wouldn't work. As soon as I typed in 0.0.0.0. into my router configuration. I checked my ports again at http://www.canyouseeme.org/, and finally they were now open. My friends were able to pull up my Foscom login page from their homes. On the third day, I was able to see my Cracus and Kelsey from my work computer, my Android tablet, and my very old Android phone. I thought I had to upgrade my cell phone, but it works just fine. I have been meaning to write something about this little dog park in El Cerrito just a couple blocks from our new house. It was one of the pluses when I was considering purchasing our new home. This is the park that's always open and within a very short walking distance. However, we don't usually see people there. A dog park is pretty lonely when there is only one or two dogs. We are hosting a young hound for a few days who needs a bit more exercise than our normal routine. We walked over to Bruce King Memorial Dog Park in the morning, and to my surprise, there was a group of dogs their with their people chatting like a group of old friends. 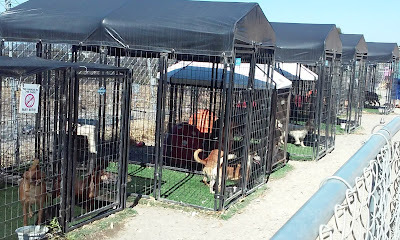 They had all sorts of toys and were all large breeds. Cracus fit right in then. He thinks he's a big dog. It turned out, they are the morning regulars who stop by every week morning before they go to work. Wow, that's dedication. We have a little bamboo patch in the backyard. It's a good and possibly bad thing. If they start taking over the entire yard, then it's a bad thing. If they stay in their own area, I can use them for various purposes. I knew that I wanted to use them to make trellis for growing anything that climbs. 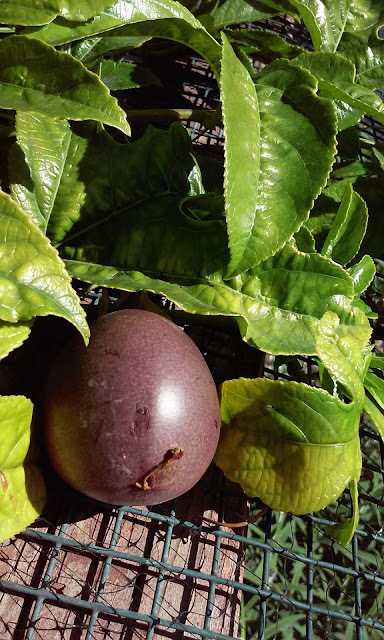 A couple months ago I planted my kiwi vines out in the garden. They have really flourished. This week is spring break, and I knew that I had to take this opportunity to cut down some bamboo and make a trellis for the kiwi vines. I have the perfect tool for sawing off the bamboo. About four years ago, I bought a Pocket Boy. It's a cute little saw that can easily hurt someone seriously. It only took seconds to saw off a bamboo stick. I saw off about 20 of them. One thing to watch out for is getting splinters from the bamboo. They are so fibrous and sharp. I put on some gloves after getting many tiny splinters. I saw off the top part with the leaves before pounding the bigger ones into the soil. I used some ribbon from old gift wraps to tie the horizontal sticks. They aren't all straight and even, but that's okay. I think they will be functional. Once the kiwi vines wrap around the trellis, you won't be able to see much of the trellis itself anyway. I will show you how it all looks in a few months.